Updating my control panel I was using several diff 12volt to 9volt power supply. 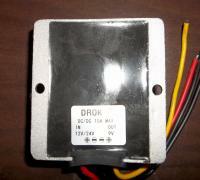 I am upgrading the 9volt power supply to a single DROK unit. Getting ready to assemble some injectors. Was down in the shop this evening, been working on the air injection system for the corn burner. Made a huge breakthrough and the R&D came thru... Will post some video after I get things assembled and built. This is a huge break thru for me I am now confident that I will be able to get the 12volt blower system to work. Nice! Looks like some serious heat in that burner. Is that a modified 12vdc marine bilge blower or did you fabricate it from scratch? What it actually is, is a ducted fan for RC planes. It has got is a 3 phase motor and a special speed controller. I did an air flow test last night and it passed with flying colors. The speed controller is powered by a standard auto battery, then you have get a servo controller to adjust speed. I made the mistake of putting my hand on the intake side and got sucked in, broke a blade and tore up one of my fingers. Nice to hear success stories. I know of another guy, Scott Haynes, a Stanley owner who used an RC airplane motor to provide forced air to his burner. I think its a good choice! Important question here....do you have any idea how the air flow stacks up against input voltage? The "official" kg thrust ratings apply. I could look it up, but for my use it is feeding a smaller tube than the actual ducted fan diameter. So it goes to empirical standards. which means do I get enough airflow out the nozzles. The test I did last night exceeded my expectations. But there's a problem with the air injection system, it needs to be heated to be able to burn unburned dust. Plus there is more surface area with the air pluming system. Ken to answer your question it pulls 30amps at 12 volts. This is also not driven by a 12volt dc motor. The motor is 3 phase and has excellent power to weight power ratio, the speed controller converts 12 volt to 3 phase AC. With the servo speed control 30amps at 12volts is the maximum setting, less is used about 12amps. And the speed control can operate with as low a 9.6 volts and still give full power. Edited 4 time(s). Last edit at 02/20/2018 06:48PM by Jeremy Holmes. I probably should have elaborated my question further. What I wanted to know was how the fan was throttled. If you have some control signal that is relatively linear to fan flow (say, perhaps, voltage) then you can rig a fuel pump that roughly matches this delivery and maintain an approximately correct stoichiometry. I could see achieving such a fuel flow with an old fashioned automotive diaphragm fuel pump actuated by an eccentric on a variable speed motor shaft. By making the eccentricity variable, you can regulate the mixture with a screw driver. This would get you within range of Doble, Carter or Barrett burners. An O2 sensor downstream could improve your control greatly without too much complexity by adjusting either the fan or pump speed somewhat. Hmmm....I wonder if you can buy the ducted fan assembly sans motor? Maybe it would work better to have the fan and fuel pump driven by a single motor, you could speed the fan up with a belt drive. It appears a ducted fan really has to be tailored for peak efficiency at a given speed. Probably need to study it more closely. That can be done, the servo responds to PWM there are two wires (red and black) with a third signal wire that is white. The third can be hooked in parallel so that two devices can be controlled by that same wire(PWM signal wire). Edited 1 time(s). Last edit at 02/21/2018 08:52AM by Jeremy Holmes. Just ordered a book from a friend, its available on amazon Looking forward to reading it. Edited 2 time(s). Last edit at 03/05/2018 10:44AM by Jeremy Holmes. You guys will have to disregard some of my posts. I ended up buying my own forum and customized the structure so that I can post youtube music videos in there own section, in this way they have there place. I did a mock-up recently and see what I have to do. Lots of work I am making a new combustion chamber and after burner section. I utilize a special coating so that the steel parts dont rust after firing. Then comes the steam superheater this one section will cost some money. I also upgraded to Solidworks 2016. Its nice when you can make the data files and hand them over to the fabricator. All this stuff is super expensive, and I dont agree with boot strapping a project together. I want the prototype to be refined. For now everything is in pieces and intend to build a final design. Things were at that point years ago but the complete design was flawed. There has been a corrected feed-pump gear ratio and I can crank 3000psi easily by hand, there is no leak down even with the injector. I wont be displaying the current prototype untill its fully constructed. Edited 1 time(s). Last edit at 11/28/2018 04:51PM by Jeremy Holmes. While I got your attention, I may display parts and subsystems. I think that you should put the design on paper, then make a schematic and follow thru with that design. Workmanship is critical and should be perfected. Im just going to post this link, its on page one, but I think its good to post again. Just to make this page and the content described took alot of time and effort, maybe 10 or fifteen years. Ive got a 2400psi Argon tank charged and ready to go. Just secured my adapter to run the engine off the argon tank. I call this dynamic testing, want to run secondary's at 650rpm full load, It will run a very long time and tests things out for over 15 minutes, but still some new footage will be better, than what we got. Just got so many things going on I cant keep up. Edited 1 time(s). Last edit at 12/14/2018 08:23PM by Jeremy Holmes. As everyone accepts "Steam Punk"
Edited 1 time(s). Last edit at 12/29/2018 04:12PM by Jeremy Holmes. Here are some videos from last year, Im basically doing some test runs. The level that Im at is more advanced than these videos. Was doing some TIG welding today. It may take a couple of months before I get things how I want them. But im just working on how to upload video stuff like that, hope its not to boring for you guys. Im still working on my feed pump gear ratio its driven by the crank of the engine. Should be worth the work. Still lots to do. I have done lots of work with my blower turbines they run off of 12volts. I appreciate you guys. Probably should post this, but Im making lots of steam. and after using the argon tank thats how she runs. this is an early stage. But I figure you guys can separate the demo... There is lots of steam in the first part of the video. and a dynamic test with argon. Just want to throw some "hard rock into the mix" its a younger generation thing. Edited 2 time(s). Last edit at 01/22/2019 11:39PM by Peter Brow. Hi Peter, I say its a generational thing for good reason..
We have boycott stuff going on because the artists committed suicide, Kurt Cobain and Chris Cornel. So we have other artists in the mix. There are some of us who want to make a useful effort and steam is something were trying get onto. Way to go. There is so much negativity in the world; "Do something positive and productive instead" is my motto. 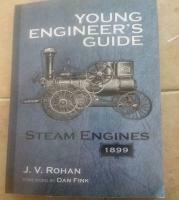 For me, that means making steam power useful and fun. I have been working on my feed pump for a year or two. Its working like it should. I can turn the crankshaft freely by hand and the feed pump goes to about 4000psi. Check out the videos and you will see what im talking about. Totally impressed! Like to see the details of the feed pump? Here is a picture of the feed pump assy.